The guide recognize our partners Jan Waselius and Tarja Wist as “Expert consultants”. Only five lawyers in Finland are ranked as Expert consultants. Partners Christoffer Waselius, Fredrik Lassenius and Lauri Peltola are ranked as “Highly regarded” and Timo Lehtimäki as “Rising star”. Waselius & Wist’s Partner Bernt Juthström has been recognised as Lawyer of the Year 2017-2018 in Finland in Intellectual Property law by Best Lawyers®. Only one lawyer is recognized as “Lawyer of the Year” for each speciality and location. Our partners Jan Waselius, Tarja Wist, Niklas Thibblin, Lotta Pohjanpalo, Tanja Jussila and Lauri Peltola were also recommended by Best Lawyers®. The “Best Lawyers in Finland 2017-2018” list is based on a survey process in which leading lawyers confidentially evaluate their professional peers. Once again Waselius & Wist has been recognized as a top-tier firm and the firm’s partners as top-tier individuals in the Legal500. The firm is highly ranked in the following practices: Banking and finance, Capital markets, Corporate and M&A, Dispute resolution, EU and competition, Intellectual property and Tax. We are proud to have once again been highly ranked in the Chambers Europe 2017, one of the leading directories to the world’s best lawyers. Our firm and our lawyers continue to be recommended in all our core practice areas. Waselius & Wist was highly ranked in the Chambers Global 2017 edition, a leading directory to the world´s best lawyers. Our company was recognized in all the reviewed practice areas: Banking and Finance, Corporate/M&A, Dispute Resolution and Intellectual Property. Our Founding partner Jan Waselius (Senior Statesmen) was again recognized among the “Most in Demand Arbitrators in Finland”. 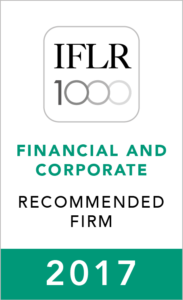 Waselius & Wist is proud to having once again received high rankings in the recently published IFLR1000 guide in all listed categories: M&A, Capital Markets, Banking & Finance and Energy & Infrastructure. Jan Waselius, Lauri Peltola and Tarja Wist are ranked as leading lawyers and Timo Lehtimäki, Christoffer Waselius and Fredrik Lassenius as rising stars.